The ground floor of the tower serves as the entrance porch to the church. The lancet windows are 14th century and the date, 1643, of the earliest monument in the south wall of the porch is just ten years after the second of the two rebuilds. A flight of 17 steps beyond the wooden door leads to the landing, thought to be Victorian, under the south window. There is an old window between staircase and porch on the way up, now only visible from the inside behind the more modern cladding seen from the porch. 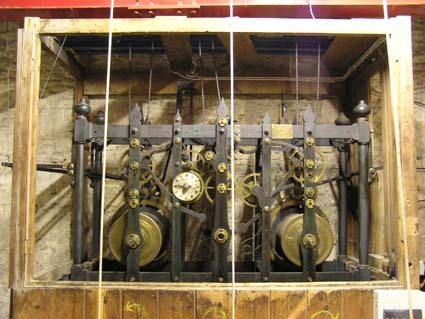 In the north-west corner there is clear evidence of the old boxed in area which housed the very long clock weights prior to the electrification of the winding mechanism in the1970s. 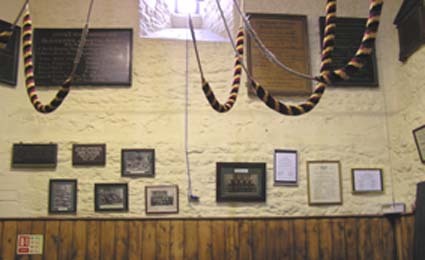 In the north-east corner hangs the rope for the ‘vicar’s bell’, which operates a clock hammer mechanism on the seventh of the eight bells and is particularly significant in induction services. On the next spiral staircase is a blocked up doorway from the church, also visible on the church side. The level of the door is thought to be that of the old organ gallery removed in 1879. Certainly the doorway is likely to have been part of the 17th century rebuild, as witness the date ‘1634’ in the centre of the lintel. A further 20 steps and one complete twist of the spiral staircase brings us to the level of the ringing chamber, a room with a high ceiling and with its north and south facing windows well above head height, as is the clock pendulum which swings inside the west wall. Around the walls is an array of peal boards, photographs, memorial plaques and trophy certificates, together with a ‘Roll of Honour’, ‘Rules for Ringers’, a crowded notice board and a modern whiteboard. Above the door is the ‘servants’ bell’, normally used as a signal that the bride and groom are on their way down the aisle following their wedding service and that the ringing should now begin! The furniture, and the bells themselves higher up, were installed into the tower via a series of trap doors between one floor and the next. Immediately above the ringing chamber is the clock chamber, a room of more modest height, just comfortably squeezed in between the ringing room windows and the bottom of the clock face. The floor level makes access from the spiral staircase impractical; instead, this is from inside the ringing chamber via a 19-rung wooden ladder and a trap door. The clock was erected in 1858 at the instigation of the then Mayor of Chippenham, Jacob Phillips, and was paid for by public subscription. The massive mechanism, which contains many very unusual features, was built by Henry Weight of Malmesbury (11 miles north of Chippenham). It is probably the only clock made by him which is still in working order. In 1976, following a public appeal by the Mayor and Town Council of Chippenham, the clock was restored by the present maintainers, John Smith and Son of Derby. Although they had to replace the clock face, they were able to retain the original mechanism. Electric winding replaced the former hand winding. From back down at the ringing room door, it is another 41 steps and two further whole turns up to where the spiral staircase ends at the level of the bell chamber. Immediately inside the door there is just sufficient space to climb up a metal ladder onto the wooden bell frame into a much more cavern-like atmosphere, with headroom extending straight up inside the full height of the spire. Most of the natural light comes through the clock face. 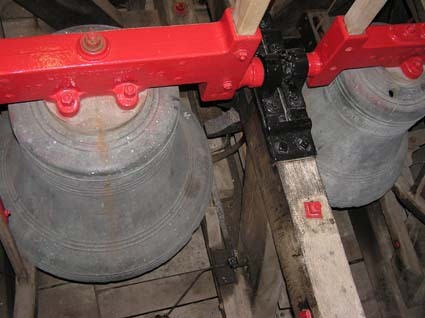 When standing on the bell frame, although clearly visible, the bells themselves are less prominent, hanging mouth down within the frame below. A second, short ladder on the centre of the south wall gives access up to the narrow outside parapet around the foot of the spire.